To detect a faulty hard disk drive before it fails, there are various diagnostic software available on internet (shareware and freeware ) that can check and report the health of HDDs. One more method is to listen to the sound produced by them while they are operating. Not all hard drives fail the same way. DataCent, a data recovery service based in Canada, has an impressive archive of failing hard drive sounds. If you’re ever in doubt about whether your hard drive needs help, this is your guide. 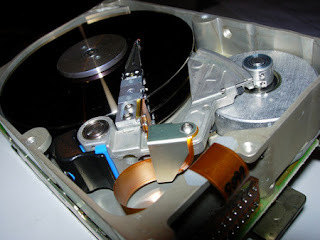 From bad heads to stuck spindles, bad hard drives click, grind, hum, and scratch. It’s almost musical in its regularity. Who will be the first person to string of these samples together into a ringtone or techno song. This website has a good collection of sound tracks produced by different HDDs of various manufacturers that are faulty and tending to fail.